1000W Battery Workstation including an EC5 input cable, will charge, discharge, monitor, or multiple cycle any current or future battery chemistry. POWER you have been waiting for, safety you have come to expect in a compact, affordable Cellpro product. 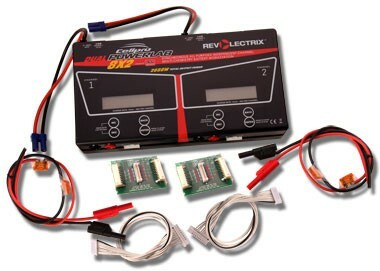 Welcome to the new class of R/C battery management. Built on the amazing PowerLab 8 technology, designed from the ground up for reliable high power, geared toward the power user but simple to operate and affordable enough for the masses. The extensive list of features and capabilities are rivaled only by the goal to provide the ultimate in flexibility and utility. Out of the box, the PL6 will run circles around the competition in terms of simple, yet powerful set up and operation. But if you are the type of person looking for the utmost in flexibility and performance, look no further. The PL6, in combination with the Charge Control Software offer virtually unlimited access to charging parameters. Inside the Windows environment, it's easy to alter up to 100 settings for any of the 25 user presets, gain access to 50 additional library presets in the unit or tap into the PC library. Major features include Advanced Power Management to help you set up and use existing Power Supplies or Pb input batteries, faster individual cell IR readout, support for all new Safe Parallel Adapters (PL6 and PL8 share the same adapters) which enable charging/discharging multiple packs simultaneously, Expansion Channel Mode for turning multiple PL6's into one workstation, regenerative discharge with input power supply protection built in. The new PowerLab 6 with EC5-equipped input cable includes a one foot long, 12AWG input wire terminating with an EC5, female pin connector. Revolectrix also has an available 2 foot long plier clip assembly to support quick inter-connect to the input power source. The available cable has the mating EC5 male pin connector-to-plier clips for connecting to a car battery or power supply. Look for this accessory further down on the store page of the web site.Click here to view product specifications and download Charge Control Software to your PC. Combo Contents: 1 Cellpro PowerLab 6 EC5-equipped Battery Workstation, 2 red/black safety banana plug-to-bare wire cable, 1 FUIM3 PC USB Interface, 2 CP8S-TP/PQ6S-PAR Safe Parallel Adapters. With the FUIM3, the PL6 supports 2 way PC communication. Use the free Cellpro PowerLab 6 Charge Control Software (CCS) to update firmware, easily alter up to 100 settings for any of the 25 user presets, gain access to 50 additional library presets in the unit or tap into the PC library. Click here to view product specifications and download Charge Control Software to your PC. Not sure which adapter you need? Click here for adapter compatibility. *Note - the new PowerLab 6 with EC5-equipped input cable includes a one foot long, 12AWG input wire terminating with an EC5, female pin connector. Revolectrix also has an available 2 foot long plier clip assembly to support the new PowerLab 6. The available cable has the mating EC5 male pin connector-to-plier clips for connecting to a car battery or power supply. Look for this accessory further down on the store page of the web site.